A few years ago, someone at Lenovo realized they could take an Android tablet, add a keyboard, and sell a cheap netbook that’s slightly more useful than a YouTube and Facebook machine. Since then, Lenovo has stopped making the A10 notebook and has moved on to manufacturing Chromebooks. That doesn’t mean this little Laptop doesn’t have some life left in it: it still has a Cortex A9 Quad core CPU, is reasonably priced on the ‘defective’ market, and can now run a full-blown Linux. When the A10 notebook was released, there was a statement going around saying it was impossible to install Linux on it. For [Steffen] that was a challenge. He cracked open this netbook and took a look around the Flash chips. There were two tiny pads that could be shorted to put the device in recovery mode, and the entire thing can be booted from a USB stick. [Steffen] ran into a problem while putting a new kernel on the netbook: there was a null pointer reference in some device during boot. The usual way of diagnosing this problem is to look at the console to see what device failed. This netbook doesn’t have a UART, though, and [Steffen] had to use an FTDI chip and set the console to USB to see why this device failed. Just about everything on this tiny laptop works right now, with a few problems with WiFi, webcam, and standby mode – all normal stuff for a putting Linux on a random machine. It’s worth it, though: the quad-core ARM is a very good chip, and [Steffen] is running x86 apps with qemu. Not bad for something that can be found very, very cheap. A few years ago, [localroger] found some incredible hardware on sale: a very tiny laptop with a seven-inch screen, full keyboard, trackpad, Ethernet, WiFi, USB (with support for a lot of HID devices), and a battery that would last hours. They were on sale for $30 USD, and [localroger] bought four of them. A great deal, you say? These machines ran Windows CE. No, owning a WinCE device is not the Fail of the Week. These machines – [roger] used three of them over the years as alarm clocks – did their job well, even if NTP had been left out of the OS image. The real fail here comes from buying a $30 WinCE netbook, and using it for something as mission critical as an alarm clock. The displays burned in, the batteries began puffing up, one unit somehow wouldn’t allow IE to run (probably a bad Flash chip), and the trackpad in another one sent the cursor on a random walk. You get what you pay for. These WinCE netbooks have finally been put out to pasture, hopefully the same one laser printers go to. It’s all for the best, though; [roger] made a much better alarm clock with Nixies. Fail of the Week is a Hackaday column which runs every now and again. Help keep the fun rolling by writing about your past failures and sending us a link to the story — or sending in links to fail write ups you find in your Internet travels. We’re well past the time when Halloween costume submissions stop hitting the tip line, but like ever year we’re expecting a few to trickle in until at least Thanksgiving. Remember, kids: documentation is the worst part of any project. [Troy] sent us a link to his wearable Game Boy costume. It’s exactly what you think it is: an old-school brick Game Boy that [Troy] wore around to a few parties last weekend. This one has a twist, though. There’s a laptop in there, making this Game Boy playable. The build started off as a large cardboard box [Troy] covered with a scaled-up image of everyone’s favorite use of AA batteries. 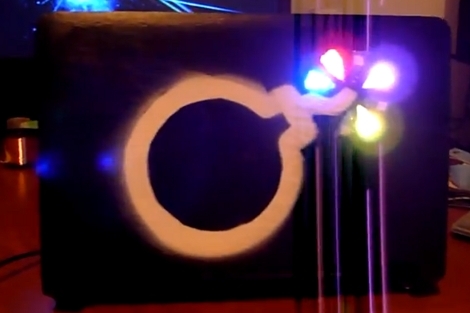 The D-pad and buttons were printed out at a local hackerspace, secured to a piece of plywood, and connected to an Arduino Due. The screen, in all its green and black glory, was taken from an old netbook. It was a widescreen display, but with a bezel around the display the only way to tell it’s not original is from the backlight. Loaded up with Pokemon Blue, the large-scale Game Boy works like it should, enthralling guests at wherever [Troy] ended up last Friday. It also looks like a rather quick build, and something we could easily put together when we remember it next October 30th. [Troy] wasn’t the only person with this idea. A few hours before he sent in a link to his wearable Game Boy costume, [Shawn] sent in his completely unrelated but extremely similar project. It’s a wearable brick Game Boy, a bit bigger, playing Tetris instead of Pokemon. [Shawn]’s build uses a cardboard box overlaid with a printout of a scaled-up Game Boy. Again, a laptop serves as the emulator and screen, input is handled by a ‘duino clone, and the buttons are slightly similar, but made out of cardboard. Both are brilliant builds, adding a huge Game Boy to next year’s list of possible Halloween costume ideas. Videos of both below. Looks like there’s a pretty easy way to install Ice Cream Sandwich, the newest version of Android, on your Netbook. 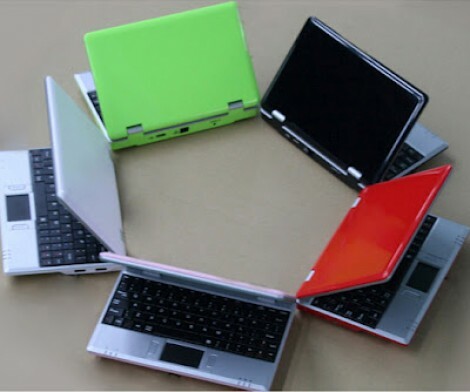 Actually this is limited to a few types of hardware including netbooks like the eeePC. That’s because the ISO files used during installation have been tailored to the hardware used on those devices. As with other Linux distros, the ISO file can be loaded on a thumb drive using Unetbootin. From there you can give it a whirl as a Live CD (or USB as it were) or choose to install it on your hard drive. We haven’t given it a spin as the eeePC version doesn’t want to boot on our Dell Mini 9, but we don’t see a reason why this couldn’t be set up as a dual boot option. 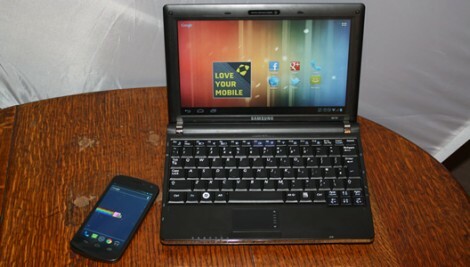 Now why would you want to run Android on your netbook? We’ve already seen that there’s a way to run Android apps in Ubuntu. We bet some people just love Android, and others just hate the Unity desktop that Ubuntu now uses… especially when the Netbook Remix had a lot of good things going for it. [Jeremy] had an ASUS EEE PC 1000HE netbook on his hands which had succumbed to a corrupted BIOS. In most situations, people replace a motherboard when the BIOS is damaged beyond repair, but considering the price of motherboards, especially those built for portable devices, he simply refused to go that route. Instead, he took it apart and did a little investigation to find out what SPI flash chip ASUS used in the netbook. 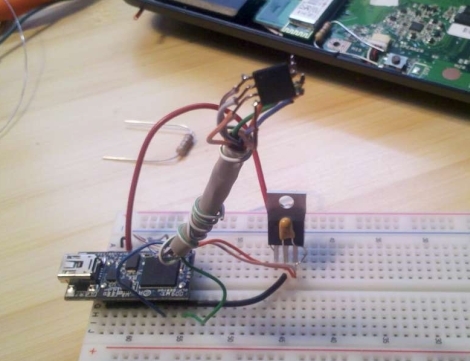 With that information in hand, he put together an SPI flash programmer using a breadboard and a DLP-USB1232H USB to UART module. He couldn’t program the flash chip in-circuit, so he had to desolder it and deadbugged it onto his programmer. Using a few Linux-based flashing tools, he was able to reprogram the chip with a functioning BIOS in short order, saving him from a costly motherboard replacement. While some motherboard manufacturers have built in secondary BIOS chips to prevent the need for this sort of recovery, it’s nice to know that the process is relatively straightforward, provided you have some basic soldering and Linux skills. This also isn’t the first time we’ve seen someone recover an EEE PC from the brink – if you’re looking for an Arduino-based alternative, be sure to check this out.